At the end of the session this last spring John and I traveled to England to spend a few days in Oxford. We went to see a show of Raphael’s drawings at the Ashmolean, a collection of over hundred and twenty of his original works of art. 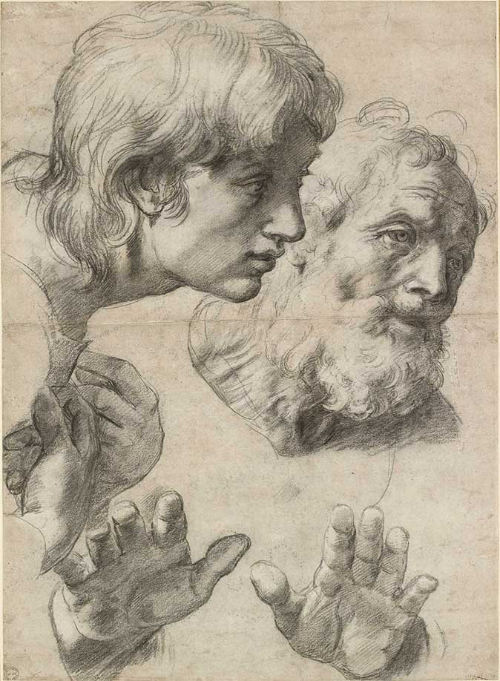 Drawing exhibitions are far and few between and I was particularly anxious to see this one because Raphael’s draftsmanship is extraordinary and difficult to find and see in person. It has been said that drawing, within the visual arts, holds the position of being closest to pure thought. (Elderfield) In this sense the drawings allow us to see inside Raphael’s mind as he composed images which would evolve into paintings, frescoes and tapestries. His exploratory line and his imaginative thought process are clearly on view in these works. You feel him working through ideas, expressing emotion with a variety of poses and exploring specific narratives. His drawings are derived from models, imagination, and sometimes from memory. What struck me most was the delicacy and fineness of his workmanship, the exquisite details and the accuracy of his line, his potent understanding of how light describes form. I learned that he often used a stylus to sketch out the preliminary form on the paper before beginning the drawing. This was called a blind line because it did not leave a mark. The drawing was then refined with either metal-point, red chalk, or charcoal. Exploring the spiraling tensions and revealing a staggering knowledge of anatomy he amplified the composition with interlocking negative space and groupings of figures. He was able to reveal the emotional quality of the figures with a minimum of information, sometimes showing only the back of a head or a gesture of the hand to communicate the mood. With rhythm, geometry, and poetry of line his drawings become a testament to the human form as an expression of life force. On the way back to Athens we stopped in London and were lucky enough to see the exhibition “Hokusai: Beyond the Great Wave” at the British Museum. This artist’s encyclopedic knowledge of nature is on show with many drawings done with ink and brush, woodblock and illustrated books. Again I was struck by the detail and careful renderings, the delicacy of his work. I think it was Ruskin who said that in fine art there must be something “fine” and I thought once again, looking at Hokusai, that perhaps this is something we’re missing in much of contemporary art. It seems that the muscular, the shocking and the mundane have more value to us than careful observation and recording of form which is so lovingly revealed in these masterworks. Although the artists lived two and a half centuries apart and on two different continents, although they depict two different cultures, there are common elements to their work. Both artists express the inexpressible through the twisting forms of human anatomy, pushing to discover at some level our common humanity and our extraordinary capacity to endure. Meticulous, patient observation combined with imagination and the desire to reveal truth is the binding principle that brings these two artists forward into our world with enduring quality. Based on fifty years of teaching experience and an awareness of the evolving profile of the contemporary student, the Aegean Center has transformed its program schedule. We have introduced intensive scheduling within a newly formatted twelve week session. We continue to offer core subjects in drawing, painting, photography, and creative writing. Art history and literature classes are still held. Core studio classes are scheduled every day for two weeks followed by a Bridge Week in which assignments, special projects and cultural activities occur, but regular classes do not meet. Then two weeks of intensive instruction resume and this pattern repeats throughout the term. This intense learning structure has proven to be enormously successful in our summer program. We see this evolution as a way to make our program more vital and responsive to our students’ needs. As an independent school we are able to respond personally and immediately because we are small by design, unaffiliated with mainstream corporate education, and, without the weight of administration and policy statements we can implement changes efficiently. We find this new format is very beneficial. The average student coming to our program is highly connected to the world through social media, but often scattered by too many commitments and pulled in too many directions. They are enthusiastic, energetic but unfocused at times. We have discovered through teaching short intensive summer classes that time spent going in depth into a subject translates into a profound pedagogical experience. In two weeks we can cover a month’s worth of material and the student retains this knowledge longer and with more comprehension. We have a clearer idea as teachers what each student in the group requires and how they best work through problems. Students are able to work steadily and calmly and don’t tend to procrastinate and leave work until the last moment. It eases social situations as people get to know each by working side by side, promoting conversation and amiability. We also know from research that learning a new skill requires deep concentration followed by down time to allow it to sink into the subconscious mind. When the subject is renewed the learner finds the information transformed and readily applicable. The above was written as a first announcement of our change of program. We are now in our 5th week of its first trial at the Center. The overall consensus is that it is a true success. I have been able to progress much more quickly through the material with far more student comprehension. In the first two weeks for instance, I taught basic drawing every day for two hours. As a class we were able to cover what would have taken 2 1/2 months in the old format. Because we could delve into topics that were going to be taken up in figure drawing in the subsequent intensive, the students were far better prepared to handle the demands of drawing the model when the time came. As I taught the figure drawing class I saw that students already had the concepts of perspective, negative space, cross contour and geometrical forms in their hands and minds. The intensive program builds relationships rapidly between the teacher and students as we get to know each other on a daily basis. The students themselves seem to bond more readily and comfortably too as the social contact takes place around classes and art. From solicited comments from students I hear that they are learning quickly but not feeling overwhelmed. During the Bridge Week they each found a different rhythm. Some took it easy the first half but worked hard later in the week to complete assignments. Others spread their time out and enjoyed having their own schedules to decide when to come to the studio and when to relax, read, or socialise. This Bridge Week some of them have planned a three day trip to Santorini at the weekend.The best aspect of the intensive for me is that I can readily read the level and engagement of each student and the group as a whole and I can adjust my lessons to keep forwarding their skill levels. It is not easy for them to procrastinate and the work becomes a daily habit. I like having the Bridge Week to introduce other activities; book craft (taught by Silina) the first time and monoprinting this week. It invigorates the program and gives the students a new and creative use for their recently acquired skills. John taught a view camera workshop and Jeffrey is taking them to the museum. The majority of the students are doing both photography and painting, nearly all are doing drawing. The overlap of differing aesthetics and media is mind expanding and challenging. Having two or three teachers a day who require that they be attentive is hard work I’m sure, but they seem to be up for it. I feel a lot more relaxed at any rate as the daily unfolding of the lessons keeps me focused without the break between classes which sometimes scatters my momentum. While hoping to find a way to take a much needed sabbatical many years ago I made some phone calls in search for a person to take over my job for a semester. I talked to a woman who taught at a well known academy in the States, someone who I felt could teach drawing and painting simultaneously as I had been doing for years at the Aegean Center. I gave her the outline of the program; a three month course, in Greece, teaching 20 hours a week, covering the gamut from printmaking to oil painting. She brushed aside my inquiry but not because she felt the weight of long hours of teaching, or because the responsibilities were onerous, but because she would need to teach drawing and painting concurrently. She said that a student needed a full year of basic drawing, followed by a full year of figure drawing before they should be allowed to touch a brush. When I explained that being a single semester abroad program prevented us from spreading out the curriculum in this way she dumbfounded me with her response. “Well”‘ she said, “I consider myself a fascist when it comes to art instruction”. I thanked her for her time and promptly hung up. In relating this story to students I often wondered whether the fascist intent was sanctioned by her academy or if it was just her own perverse mindset. I have unfortunately seen and heard of teachers who felt their method was uniquely correct and had no tolerance for other viewpoints. In art classes the slavish adherence to what is fashionable and a blindness to tradition can narrow students responses. As teachers we must all ensure that our students learn the basic skills that will serve them in future no matter which direction the art world takes. I am deeply committed to obtaining and practicing these skills, but to be a self proclaimed fascist in order to attain that objective is repugnant. Recently I contemplated her response again and thought about it in context to the current political climate. It still horrifies me and I still fight against the dictates that her statement implies. The Liberal Arts were conceived to educate citizens who could uphold the highest ideals of the Greek and Roman cultures. Rhetoric, grammar, logic comprised the trivium and to these were added the quadrivium of arithmetic, geometry, music and astronomy. Over the course of the centuries a liberal arts education has come to means something broader but it still indicates a course of study which seeks to inculcate a student to uphold the fundamental underpinning of a democratic society. The arts, especially the visual arts, play a role in embedding memory, culture and history into the minds of citizens. The museum plays its part as well as the galleries, publications and criticism. The arts aspire to imagination, forward thinking, to uphold aesthetic ideals and keep sensitivity alert. This perhaps is why the first thing many dictators do is imprison the artists and poets. But art can also be fashioned into propaganda and can in itself become weighted down with rules and dictates. And apparently teaching art can become fascistic as well. If we are to remain an open society we need to teach the creative process and embody it as well in our teaching. I try to foster a creative environment in the studio along with emphasizing the discipline that learning an art form demands. Strangely, many art students do not feel creative. The striving to make something of merit often stifles the urge to begin. Creativity requires a certain amount of mess, of boredom, of play and practice in order to perform its magical alchemy. Rigid hierarchical formulae do not help to promote its appearance. We cannot be creative if we are being taught that conforming is the most important requirement. This is why so many students feel that being creative is a rare gift rather than a natural outcome of their nature, too many years spent in graded, monitored, tested classrooms can kill off the ability to create. Often beginning students are intensely creative before fear and compliance knock them back into simply performing for others. As the last days of October come in with clouds and cold winds, we have arrived at our half term break. Some of the students will be travelling, but the majority of the group are choosing to stay in Paros to work in the studios and the digital lab. It has been a busy and event filled semester. After returning from Italy we introduced the landscape of our lovely island with several hikes, the first was a walk above Lefkes to the inner valley beyond the windmills. There among the olive trees John read an entry from his journal from the time he lived on the Navajo Reservation in Arizona. It never fails to move his audience and this time there was a deep quiet as he finished. His words touched us all. Last weekend we sailed around Antiparos with Captain Tasso and had a meal at Zombos, a restaurant at the southern end of the island facing Despotico. We had just strolled about the new excavations of the ancient temple, getting a glimpse into the working of the restorers who are rebuilding the facade of the temple. The winds came up as we finished our meal and Captain Tasso felt we needed to start back to avoid the oncoming storm. It caught up with us anyway and we all got wet, but the students sang and huddle together and we were rewarded with a full rainbow as we turned the corner toward Paros and home. A few days ago Dimitra Skandalis gave a guest lecture on her work just before she returned to her new home in San Francisco. She shared her ideas and her passions with students and brought along some samples of the work she does with seaweed. She is a former student who is originally from Paros. Her exhibition at the school this summer was her first solo show here on the island. Now with a much needed break to consolidate information and clarify goals, the students will come back to finish the semester work and prepare to display their efforts for the final exhibition in the first week of December. Cliffs of volcanic detritus on the backside of Antiparos. An advertising professional based in Dubai, Aanchal Sethi is currently taking a sabbatical to attend the Aegean Center’s fall semester. Here is a post from Aanchal’s own blog, reposted here in full with Aanchal’s permission. I stand in the corner of the dining room with a champagne glass in hand listening intently to the toast Jane is making. My eyes, trying to hide the tears that are developing look deeply into the bubbles that surround the rim of the class. My heart, open and full, speaks to the smile that forms on my lips. For the first time in years, I am present in a moment created by someone else that reflects everything I feel. In the past few weeks, I have been asked several times to explain how my sabbatical is coming along. People expect long and detailed answers and all I can give them is a simple – ‘it’s going great’ reply. I haven’t found a descriptive word to describe this experience. From drawing straight lines to understanding the depth and reason behind Bellini’s Madonna and Child to letting myself free in theater and seeing shapes between objects – in the past one month, I have learned how to learn. It is bewildering what being a child again can do to you, when the fear of not knowing is taken over by the wonder of discovery. I have sat in the same squares of Tuscan towns where I sat a few years ago with a gelato in hand and realized that places don’t change, people and circumstances do. And perhaps that is why we move on. I have broken out of my comfort zone and surrounded myself with youth to relish the truth that age is in the mind. I have felt blessed when young women have told me that my life is a goal for them for that is the one thing I usually take for granted. Feeling like a tiny speck in the grandness of the universe and adorned by the power of art, I have shed tears of gratitude in a man-made wonder. I took this sabbatical to discard the entrenched feeling of stagnation that has been reigning over me for a few years. Trapped in the corporate world, I have been a slave to my monthly salary that never leaves me content. My growth, often restricted by my own inhibitions to try new things, has stunted year after year of my so called adult life. My thoughts are interrupted as Jane toasts to our individual renaissance in Italy and that is when it hits me. The one word I have been looking for to describe this journey. Here’s looking forward to what Greece has to bring and looking at the world from a new set of eyes and wonder! The past month the Aegean Center for the Fine Arts marked the 28th year of its Italy program. The new group of students arrived in early September at the Villa Rospigliosi, the Aegean Center’s home in Italy. Up in the hills overlooking the Tuscan city of Pistoia, the students became accustomed to life at the Villa; classes throughout the day including drawing, photography, writing and theatre, and sharing prepared meals by the Villa chefs, who have been with the Center since the very first years. The bulk of the Italy program involves touring the great centers of the Italian Renaissance, including Florence, Siena, Venice, Pisa, Pistoia, Rome and for the first time ever for the Aegean Center, Bologna. In Florence, the Center was able to visit the newly reopened Museum of the Works of the Duomo featuring a new layout which recreates the facade of the Cathedral with original sculptures set in niches. We toured through the great churches and museums of Florence including the Bargello and the Uffizi. As always, the Brancacci Chapel in the church of Santa Maria del Carmine was a highlight of the tours in Florence. Inside the chapel the group was able to enjoy thirty minutes to themselves to study and admire the great fresco masterpieces of Massacio and Masolino. The Aegean Center with the Duomo of Florence in the distance. On one rainy day, our bus brought us through the Tuscan hills to Siena, where we were fortunately greeted with clearer skies and sunshine. The Cathedral of Siena was less crowded than usual and we were able to admire its incredible array of sculpture and decor, its fascinating floors and the colorful Piccolimini library. During our second week in Italy, the Aegean Center visited Venice for three days. Upon arriving, art history professor Jeffrey Carson led the tour through the Piazza San Marco and up in to the Basilica of San Marco to see the original bronze horses, taken from the hippodrome of Constantinople. The next day the Aegean Center toured the great painting museum of Venice, the Accademia and found some of our old favorites, works by Giovanni Bellini, Giorgione, and Titian. After returning to Venice we continued our tours through Tuscany with a visit to Pisa where we enjoyed a bright sunny day in the “Piazza dei Mirocoli,” (the Plaza of Miracles) with its beautiful marble faced buildings: the Cathedral of Pisa, its baptistery, the Campo Santo and of course, the Leaning Tower. In the baptistery, Studio Arts professor Jane Pack described the innovative work of Nicola Pisano’s pulpit and we were able to hear the incredible acoustics of the baptistery interior as one of the guards made a call in to its dome which echoed with his own response. The Aegean Center visited Bologna for the first time as well. The home of the oldest university in the world, Bologna welcomed us in its rich array of historical and religious centers, including the Basilicas of San Petronio and San Domenico. Although we were unable to see Giambologna’s Fountain of Neptune (under restoration) and Raphael’s Ectasy of St. Cecilia (currently on loan for the Pushkin Museum’s “Raphael. The Poetry of the Image” exhibition) we were taken by the austere beauty of the medieval and premedieval church complex of Santo Stefano and the energy of the city itself. The Aegean Center students enjoyed our last meal at the Villa Rospigiliosi and thanked the Villa chefs with a thank you card and applause. Saying farewell to the Villa is always bittersweet, a mixture of sadness and excited anticipation with what lays ahead: Rome and finally Greece! In Rome, director John Pack led the students through a winding tour of Rome’s downtown. John took the students through its famous piazzas, complete with stops for Granita di Cafe in front of the Pantheon and a trip up the Capitoline hill to view over the ancient Roman forum. The next day Jane led the group through the magical Palazzo Massimo to see its treasures including the bronze Pugilist, the dying Niobid and the lovely garden frescoes from the Villa Livia. Finally on our last day in Rome the Aegean Center woke up at the crack of dawn to visit the Vatican museum and where we had the Sistine Chapel all to ourselves, entering before any other group. We all gasped at Michelangelo’s achievements, awestruck and moved. Rome marked the final leg of the Aegean Center’s Italian tour and the students then departed for Athens. There, under the characteristically bright Greek sunlight, art history Jeffrey Carson led the students up to the Acropolis to see the monument to the magnificence of the Ancient Athenians: The Parthenon. That night, one of the students, Aria Higgins, invited the entire Aegean Center to dine at her family restaurant, Mama Roux. The last day of touring before the students’ arrival in Paros was at the greatest museum of ancient Greek antiquities in the world, the National Archaeological Museum of Athens. Visiting the National Archaelogical Museum in Athens. Now the students have all arrived in Paros, to settle in and prepare for the classes ahead. We are all excited to see what else will be accomplished with this close knit, energetic and talented group of students.